A guest star appeared within the asterism Wěi during the second lunar month of the 18th year of the Tai-Yuan reign period, and disappeared during the ninth lunar month. The second lunar month mentioned in the record corresponds to the period 27 February to 28 March 393 CE, while the ninth lunar month ran from 22 October to 19 November 393 CE. The bowl-shaped asterism named Wěi is formed by the tail of the modern constellation Scorpius. 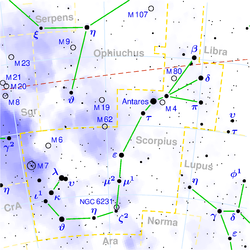 This asterism consists of the stars in Scorpius designated ε, μ, ζ, η, θ, ι, κ, λ and ν. The guest star reached an estimated apparent magnitude of −1 and was visible for about eight months before fading from sight, whose lengthy duration suggests the source was a supernova. Before 1975, the observation made by the Chinese between February and March 393 CE was considered to be likely a bright nova with a secondary maximum. At the time, there were only seven possible candidate supernova remnants near where SN 393 was observed. Assuming maximum –1 magnitude occurred close to 10,000 pc (33,000 ly) away, this immediately ruled out four possible candidates. Another discounted remnant was G350.0-1.8, as the expectant expansion rate indicated the supernova occurred around 8,000 years ago. Of the two remaining sources, G348.5+0.1 and G348.7+0.3, were both at the required 10,000 pc. distance and also each had estimated ages of 1,500 years. If true, it seems unlikely such supernovae would be visible to the naked eye over eight months, especially because they occurred close to a particularly dusty part of the galactic plane. During 1996, the ROSAT All Sky Survey discovered another nearby supernova remnant, RX J1713.7-3946, which two years later, was suggested as a better match for SN 393. Observations in 1999 suggested that this remnant was associated with H II region, G347.611 +0.204, whose distance was about 6,000 pc (20,000 ly), but in 2003, examining interactions between a nearby molecular cloud and the expanding remnant found the closer distance of around 1,000 pc (3,000 ly). In 2004, measures of the degree of X-ray and neutral hydrogen absorption by intervening matter between the remnant and Earth, confirmed this closer distance, making the true physical remnant diameter as 20 pc (65 ly), assuming the apparent angular diameter of about 1.2° or 70 arcminutes. Supernova remnant RX J1713.7-3946 is consistent with type II or type Ib supernovae. SN 393's progenitor had a mass of at least 15 solar masses, whose destruction generated energies of about 1.3 × 1051 erg, with three solar masses of material ejected into the surrounding interstellar medium. ^ a b Berezhko, E. G.; Völk, H. J. (February 2010). "Nonthermal and thermal emission from the supernova remnant RX J1713.7-3946". Astronomy and Astrophysics. 511: A34. arXiv:0910.2094. Bibcode:2010A&A...511A..34B. doi:10.1051/0004-6361/200913312. ^ a b c Wang, Zhen-Ru (2005-04-01). "The impact of historical Chinese astronomical records". Astrophysics and Space Science. 305 (3): 207–210. Bibcode:2006Ap&SS.305..207W. doi:10.1007/s10509-006-9187-8. ISBN 9789211009590. ^ a b c "SN 393 -- SuperNova". SIMBAD. Centre de Données astronomiques de Strasbourg. Retrieved 2011-07-16. ^ a b Acero, F.; et al. (October 2009). "A joint spectro-imaging analysis of the XMM-Newton and HESS observations of the supernova remnant RX J1713.7-3946". Astronomy and Astrophysics. 505 (1): 157–167. arXiv:0906.1073. Bibcode:2009A&A...505..157A. doi:10.1051/0004-6361/200811556. ^ a b c Clark, D. H.; Stephenson, F. R. (October 1975). "The remnants of the supernovae of AD 185 and AD 393". The Observatory. 95: 190–195. Bibcode:1975Obs....95..190C. ^ a b Clark, D. H.; Stephenson, F. R.; Stephenson, F. R. (September 1976). "Which historical new stars were supernovae". Quarterly Journal of the Royal Astronomical Society. 17: 290–302. Bibcode:1976QJRAS..17..290C. This page was last edited on 24 October 2018, at 17:20 (UTC).